The filler is out of operation but still installed. Bottle Filler for beer, make Pirzer, type: Nova 24/6, pressure filler for 2.000 – 6.000 bph, with 24 special long pipe filling valves (no pre-evacuation necessary) and 6-head crown capper, adjust to 0,33 lt bottles, bottle height 150-300mm, direction: left->right, built 1981, overhauled and ready for operation, for sale for 68.000 €. 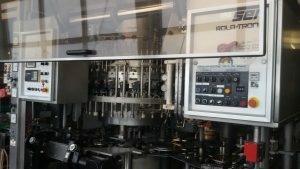 Bottle Filler, make KHS / SEN, type: Rola-Tronic H2, for 10000 bph, adjust to 0,5 lt NRW- and 0,33 lt Ale bottles, with different replacement parts, built 1987, until end of October in Operation, for sale for 45.000 € o.n.o. 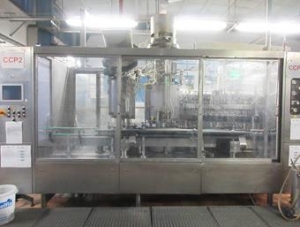 Bottle Filler, make Nagema, type: Varifill VF 70, for Beer and CSD, adjust to 0,5 lt Longneck, 0,25 + 0,75 lt individual bottle, with 70 filling valves, 15-head crown capper, 10-head screw capper for aluminum caps, with pre-evac, electr. Height adjustment, direction: right ->left, with Siemens S7-control, built 1994, already dismantled, for sale for 66.000 €, ex location. Further Filler / capper we offer on request.